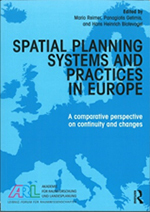 Ideal for students and practitioners working in spatial planning, the Europeanization of planning agendas and regional policy in general Spatial Planning Systems and Practices in Europe develops a systematic methodological framework to analyze changes in planning systems throughout Europe. The main aim of the book is to delineate the coexistence of continuity and change and of convergence and divergence with regard to planning practices across Europe. the different planning modes and tools reflected in the different "policy and planning styles". along with two additional case studies focusing on the recent developments in eastern European countries by looking at Poland and in southern Europe looking at Turkey.